Princess Anastasia was homeless, and lived and died in the Castro. Two different families piece together a life. On a Saturday afternoon in February, a group of 15 men stood chatting on the back patio of the Eagle, a leather-themed gay bar on 12th Street in San Francisco. The lone female of the group, 55-year-old Donna Merlino, known as Downtown Donna, untangled a heap of heavy extension cords and powered up a Crock Pot full of lamb stew. Wearing a black leather vest and sturdy black boots, Donna set up two tables of food for the guys, who sipped pints of beer surrounded by paintings of pantless Freddie Mercury lookalikes with enormous genitalia. The lamb stew was one of the dishes served as part of a “beer bust” benefit in honor of Anastasia Walton, a homeless, transgender woman who died mysteriously on a bench in front of a Peet’s Coffee in the Castro neighborhood two months earlier. Bar patrons chipped in $15 apiece for unlimited beer and plates of food that Donna carefully arranged. It was all in an effort to raise money to provide Anastasia with a proper memorial service. Donna and other Castro LGBTQ activists didn’t know whether Anastasia had any family. So, like many in this neighborhood, they made their own. Anastasia lived and died in front of the local coffee shop. Perhaps because she spent her final days on the street, the legend of Anastasia was just starting to take shape by the people who saw her every day but barely knew her. To some she was a landmark of a vibrant neighborhood, someone you could always count on seeing on a bench somewhere within her two-block haunts between upper Market and Sanchez and Noe Streets. Others remembered her as a deeply troubled individual who threatened the lives of local business owners and refused help up until the day she died. Many assumed she ended up homeless because she was rejected by her family for being transgender. To San Francisco city officials, Anastasia’s death was a reminder that the city needs to improve its services for the mentally ill homeless population in order to help prevent other people from dying on the street. Hundreds of miles away in Laguna Hills, California, Nedalee Thomas hosted a different memorial service—this one remembering the life of Theodore “Ted” Walton, Nedalee’s younger brother, who at one time had a thriving career as a female impersonator in Las Vegas. Nedalee learned from the Medical Examiner that her brother was called Anastasia, and she was shocked to find out her brother identified as female in the coroner’s report, in accordance with a new California law that aims to respect the decedent’s desired gender identity in death. She never knew the gruff woman who died, without shelter, on the streets of a new city. 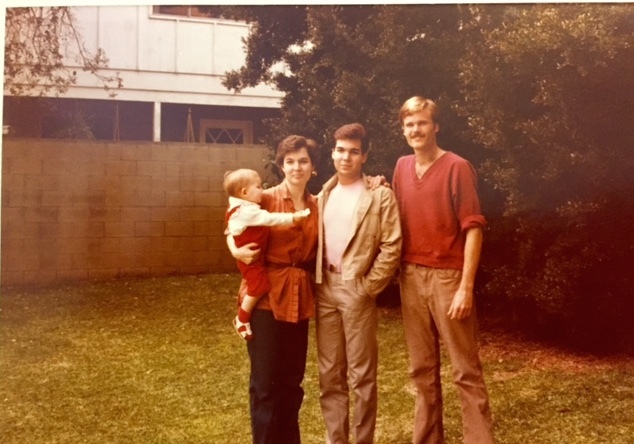 Nedalee and Ted, circa 1982, with her husband and child. Around the corner and across Market Street from where Donna first met Anastasia sits Cafe Flore, a historic Castro safe haven where the restaurant’s new owner Stu Gerry says artists and runaways have been congregating for more than 40 years. A beautiful dark wood bench spans the entire length of the cafe’s exterior and during the six months since Stu took over ownership, the bench was one of Anastasia’s regular neighborhood perches. Gerry heard stories from longtime employees of Cafe Flore that there was a time when Anastasia was a friendly “normal” customer. “They say she used to come in and drink champagne, order dinner, tip well, and not yell at anybody.” By the time he took over last August, however, Anastasia was living in a delusional state outside of the cafe. Some employees say she demanded they call her “Princess Anastasia” or “Her Majesty.” Nicholas Nelson, a server at Cafe Flore, said she had a beard, wore scarves on her head, a ratty brown fur coat and high heels. Gerry said Anastasia always walked the streets in front of his café in a pair of beat-up, too-small women’s bedroom slippers. Providing safe havens has been one of the main focuses of Bevan Dufty’s political career. As the director of San Francisco’s Housing, Opportunity Partnerships and Engagement (HOPE) office, Dufty has been working on behalf of the city government to provide alternatives to people living on the street. He often gives his card to homeless people he sees and encourages them to take advantage of the city’s outreach services. Dufty and Anastasia would nod at one another when they crossed paths in the Castro, but she never asked for his help. “She was always pretty animated in discussion with herself,” he says. Providing aid for the mentally ill homeless community has been a challenge for the City of San Francisco. As a result, the city’s HOPE office recently expanded its homeless outreach team with the help of Supervisor Mark Farrell and Mayor Ed Lee, who increased the city’s homelessness budget by $3 million this year, according to Bevan Dufty who also said in January, the San Francisco government added 27 new staff members to the outreach team, many who have medical and mental health training. Dufty believes this is an improvement over the past peer model of homeless outreach, whereby people who have been rehabilitated through city services hit the street to encourage others to take advantage of those same resources. For people like Anastasia, whose coroner’s report states that she suffered symptoms of grandiosity, delusions, and paranoia, she may not have been able to accept help, so peer outreach may not have been effective. That leaves involuntary psychiatric confinement by a police officer, or a 5150 hold, as her only viable option for help. Anastasia’s time of death was recorded at 10:05 a.m. “The subject, a transgender female (anatomical male) approximately 50 years of age, has no known address at the time of this investigation,” the city’s death investigator wrote in the report. “She was found deceased lying on a bench in front of 2257 Market Street.” When she died Anastasia was wearing a dark blue pea coat, black pants and a white metal Mickey Mouse watch. Nearly $68, three Peet’s gift cards, and a Visa debit card were found in the inside pocket of her coat. Initially it was reported that Anastasia died from exposure, but Christopher Wirowek, the acting Medical Examiner Deputy Administrator, says the physician who initially performed Anastasia’s examination ordered additional analysis. Downtown Donna convinced the Medical Examiner’s office to waive all of the fees associated with transporting and cremating Anastasia’s body, and provided the Examiner’s office with everything she knew about Anastasia’s health, including her delusional physical conditions. On April 15, 2015 nearly four months after her death, Assistant Medical Examiner Ellen Moffatt determined Anastasia Walton died of natural causes. Both her toxicology tests for drugs and alcohol were negative, and her death was attributed to cardiomyopathy, a condition that results from an abnormality of the heart muscle. In the months following Anastasia’s death, as homeless rights activists worked to figure out how to best memorialize someone who died with so little, Downtown Donna learned that the coroner’s office finally made contact with Anastasia’s family. Back at the Eagle bar, Donna walked around the small groups of men holding an empty beer pitcher and asked for donations. Everyone she approached threw in a couple of bucks. Only a handful of people bought a plate of food, including Felicia Elizondo, a 68-year-old trans woman who donated $100 to Anastasia’s memorial fund on behalf of the Screaming Queens fundraising committee that she heads. Donna sat down next to Felicia and asked her how the stew turned out. “Nobody wants to come to a bar and talk about homeless people,” Donna said, looking out at the small crowd that included Bevan Dufty, who with Donna decided to memorialize Anastasia with a plaque at the new LGBT homeless shelter that supervisor David Campos is spearheading. At six o’clock, the day drinkers at the Eagle gave way to the night drinkers, who may not have paid much attention to Anastasia when she was alive, but might be convinced to chip in a little now. Nedalee, meanwhile, hosted her own memorial. She said that some of Ted’s old friends flew in for the event, including a former classmate who travelled to the service from Houston and donated money in remembrance of Ted to an anti-bullying campaign. Downtown Donna was surprised to learn that Nedalee was unaware of Anastasia’s gender identity, but the stories rarely are easy for the homeless and their families. In San Francisco, there are more than 6,000 homeless. One in four identify as LGBTQ, and two out of three reported one or multiple disabling conditions. With little access to regular health care, the life expectancy for a person without permanent housing is between 42 and 52 years old. Anastasia was 50. Leah Rose is a San Francisco-based journalist. Leah also hosts The Upshot, a podcast that features in-depth conversations with investigative journalists.